I consider myself to be one of those people who is more of a “Jack of all (many) trades” than a master of any one thing. I like the fact that I will attempt almost anything at least once, learn from my mistakes and sometimes try it again so I can do a better job the second time around. If I achieve some degree of success and find the experience enjoyable and rewarding, I will continue to perfect that particular skill. The problem with this is that I love to try new things and therefore don’t really have a specific area of expertise. So, I do many things well, but few with the level of excellence I have grown to expect of myself. Such is the case with card making. My experience with “paper crafts” stems from a scrapbooking background. Although many of the techniques are the same, I can’t say that I spend much time making cards. Basically, I haven’t dabbled in card making enough for the task to be quick and easy for me. I make a card when I need one and will often just give purchased cards or make a little gift tag in lieu of a homemade card. It is for this reason that I have a set of steps that I subconsciously follow when planning the layout for a card ~ this just helps to give me some direction when starting a project. I start by picking the paper I want to use. I usually include a solid colour along with one or two coordinating printed papers. I often include something linear like ribbon, washi tape or even long narrow strands of paper. Although I don’t always include an element like this, I find it is my “go to” card embellishment. I then consider what my focal point is going to be ~ a sticker, a layered paper image (made with my Cricut), buttons, flowers, felt shapes, etc. For the actual layout, you need to keep in mind where you want the eye to be drawn. Finally, I think about the greeting or message I want on the card and how I am going to achieve it ~ computer, stamps or letters cut from my Cricut. I chose the paper colours based on the colours I was using for the theme of the party. I am mostly using “butcher paper brown” and white, but have also included a hint of blue to tie in the colours I used in her birthday invitations. I have many embellishments on hand, so I simply went through what I had. I obviously was looking for items that specifically fit into either the winter/snowflake theme or my colour scheme. For this card, I chose a roller stamp that was kind of swirly and whimsical like falling snow. I also found a white snowflake brad, a few snowflake stamps, a foam “SNOW” word that I cut out from a border that was in the paper package I used for the invitations and some Cricut cut snowflakes and lettering. For this card, I used the same ribbon that I used on the invitations as well as some pre-cut white borders I had on hand. I wanted the focal point to be the words on the card, so I made sure that this stood out and that nothing else on the card competed with the message. Again, for this particular card, my greeting and the focal point were one and the same. The other embellishments added a bit of dimension and appeal to the card, but were not meant to be the centre of attention. inked edges ~ I find that a bit of ink on the edges of the paper help distinguish one layer from an other and make an element stand-out and not get lost in the layout. pop dots ~ 3D adhesive dots help to lift an image or letter off a page and thus give the project some dimension. opalescence glitter glue ~ by this I mean glitter glue that is more clear than any specific colour, but just adds a bit of shimmer to the edge of an image, centre of a flower or tips of a snowflake. The glitter is not “tacky looking” or over powering, but more just a hint of shimmer when the light hits it just right. Here is a look at how I used these principles to create Eden’s birthday card. Create your first layer. This was done with a few stamps. Add something linear (if you wish). This was created with ribbon and a white paper border. Decide on your focal point. In this case, I wanted the message to be the highlight of the card. Add additional embellishments to create a completed look. In addition to decorating the outside, I was looking for something for the inside as well. In this case, I found a poem that works perfectly. I will mount the poem inside the card and then write her a personal message. My kids love these homemade cards and often keep them by their bed and read the personal messages we write inside. A birthday is the perfect opportunity to tell your loved ones how special they are and how much they are truly loved. Shay has even been known to keep special cards under his pillow and sleep with them. It really is worth the extra effort to let them know how important they are. Here is the poem that I found. 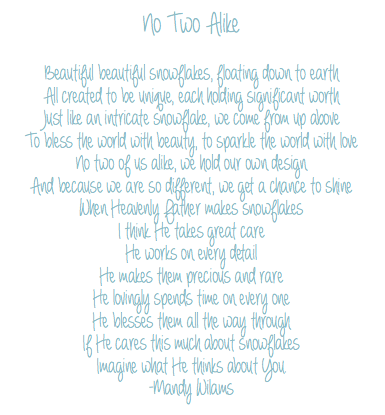 Credit for this lovely poem goes to Mandy Wilams.